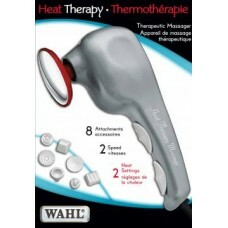 The Wahl Heat Therapy Massager features a heat attachment with 2 settings to help circulation and pain relief. Penetrates deep to soothe stiff, aching muscles. Customize the speed to relax with a gentle massage or intense for a deep massage. 8 attachments to customize your massage experience. Ordered the EV-906. Delivery received within business days. Packaged very neatly, inside a black case. Unit size is approximately 5” by 3”. Solid sturdy design. Feels like those solid Sony Walkmans. Only lighter. LCD screen = large. Everything clearly visible. Rubbery buttons = excellent. I wanted to be sure that I can use this wall outlet for power. To avoid buying batteries. And It does come with power adapter to use as such. Batteries were also shipped. 4 channels, each with to pads. So total 8 pads were shipped with unit. Extremely satisfied with unit, and mywellcare.ca service. Definitely would highly recommended the EV-906. I purchased a portable ultrasound device from MyWellCare.ca. A couple of months later I reported a problem with the power adapter for the ultrasound device. I got a quick response the next day by email and phone that the replacement is already shipped to me. I just wanted to thank you for a great customer service.You cannot beat this.